The nucleus is the center of an atom. It is made up of nucleons (protons and neutrons) and is surrounded by the electron cloud. The size (diameter) of the nucleus is between 1.6 fm (10−15 m) (for a proton in light hydrogen) to about 15 fm (for the heaviest atoms, such as uranium). These sizes are much smaller than the size of the atom itself by a factor of about 23,000 (uranium) to about 145,000 (hydrogen). The nucleus has most of the mass of an atom, though it is only a very small part of it. Almost all of the mass in an atom is made up from the protons and neutrons in the nucleus with a very small contribution from the orbiting electrons. Neutrons have no charge and protons are positively charged. Because the nucleus is only made up of protons and neutrons it is positively charged. Things that have the same charge repel each other: this repulsion is part of what is called electromagnetic force. Unless there was something else holding the nucleus together it could not exist because the protons would push away from each other. The nucleus is actually held together by another force, the strong nuclear force. The word nucleus is from 1704, meaning “kernel of a nut”. In 1844, Michael Faraday used nucleus to describe the “central point of an atom”. The modern atomic meaning was proposed by Ernest Rutherford in 1912. The use of the word nucleus in atomic theory, however, did not happen immediately. In 1916, for example, Gilbert N. Lewis wrote in his famous article The Atom and the Molecule that "the atom is composed of the kernel and an outer atom or shell". The nucleus of an atom is made up of protons and neutrons (two types of baryons) joined by the nuclear force. These baryons are further made up of sub-atomic fundamental particles known as quarks joined by the strong interaction. 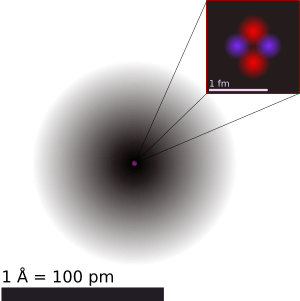 The isotope of an atom is based on the number of neutrons in the nucleus. Different isotopes of the same element have very similar chemical properties. Different isotopes in a sample of a chemical can be separated by using a centrifuge or by using a mass spectrometer. The first method is used in producing enriched uranium from regular uranium, and the second is used in carbon dating. The number of protons and neutrons together determine the nuclide (type of nucleus). Protons and neutrons have nearly equal masses, and their combined number, the mass number, is about equal to the atomic mass of an atom. The combined mass of the electrons is very small when compared to the mass of the nucleus; protons and neutrons weigh about 2000 times more than electrons. The discovery of the electron by J. J. Thomson was the first sign that the atom had internal structure. At the turn of the 20th century the accepted model of the atom was J. J. Thomson's "plum pudding" model in which the atom was a large positively charged ball with small negatively charged electrons embedded inside of it. By the turn of the century physicists had also discovered three types of radiation coming from atoms, which they named alpha, beta, and gamma radiation. Experiments in 1911 by Lise Meitner and Otto Hahn, and by James Chadwick in 1914 discovered that the beta decay spectrum was continuous rather than discrete. That is, electrons were ejected from the atom with a range of energies, rather than the discrete amounts of energies that were observed in gamma and alpha decays. This was a problem for nuclear physics at the time, because it indicated that energy was not conserved in these decays. The problem would later lead to the discovery of the neutrino (see below). In 1906 Ernest Rutherford published "Radiation of the α Particle from Radium in passing through Matter". Geiger expanded on this work in a communication to the Royal Society with experiments he and Rutherford had done passing α particles through air, aluminum foil and gold foil. More work was published in 1909 by Geiger and Marsden and further greatly expanded work was published in 1910 by Geiger, In 1911-2 Rutherford went before the Royal Society to explain the experiments and propound the new theory of the atomic nucleus as we now understand it. Around the same time that this was happening (1909) Ernest Rutherford performed a remarkable experiment in which Hans Geiger and Ernest Marsden under his supervision fired alpha particles (helium nuclei) at a thin film of gold foil. The plum pudding model predicted that the alpha particles should come out of the foil with their trajectories being at most slightly bent. He was shocked to discover that a few particles were scattered through large angles, even completely backwards in some cases. The discovery, beginning with Rutherford's analysis of the data in 1911, eventually led to the Rutherford model of the atom, in which the atom has a very small, very dense nucleus consisting of heavy positively charged particles with embedded electrons in order to balance out the charge. As an example, in this model nitrogen-14 consisted of a nucleus with 14 protons and 7 electrons, and the nucleus was surrounded by 7 more orbiting electrons. The Rutherford model worked quite well until studies of nuclear spin were carried out by Franco Rasetti at the California Institute of Technology in 1929. By 1925 it was known that protons and electrons had a spin of 1/2, and in the Rutherford model of nitrogen-14 the 14 protons and six of the electrons should have paired up to cancel each other's spin, and the final electron should have left the nucleus with a spin of 1/2. Rasetti discovered, however, that nitrogen-14 has a spin of one. In 1930 Wolfgang Pauli was unable to attend a meeting in Tübingen, and instead sent a famous letter with the classic introduction "Dear Radioactive Ladies and Gentlemen". In his letter Pauli suggested that perhaps there was a third particle in the nucleus which he named the "neutron". He suggested that it was very light (lighter than an electron), had no charge, and that it did not readily interact with matter (which is why it had not yet been detected). This desperate way out solved both the problem of energy conservation and the spin of nitrogen-14, the first because Pauli's "neutron" was carrying away the extra energy and the second because an extra "neutron" paired off with the electron in the nitrogen-14 nucleus giving it spin one. Pauli's "neutron" was renamed the neutrino (Italian for little neutral one) by Enrico Fermi in 1931, and after about thirty years it was finally demonstrated that a neutrino really is emitted during beta decay. In 1932 Chadwick realized that radiation that had been observed by Walther Bothe, Herbert L. Becker, Irène and Frédéric Joliot-Curie was actually due to a massive particle that he called the neutron. In the same year Dmitri Ivanenko suggested that neutrons were in fact spin 1/2 particles and that the nucleus contained neutrons and that there were no electrons in it, and Francis Perrin suggested that neutrinos were not nuclear particles but were created during beta decay. To cap the year off, Fermi submitted a theory of the neutrino to Nature (which the editors rejected for being "too remote from reality"). Fermi continued working on his theory and published a paper in 1934 which placed the neutrino on solid theoretical footing. In the same year Hideki Yukawa proposed the first significant theory of the strong force to explain how the nucleus holds together. With Fermi and Yukawa's papers the modern model of the atom was complete. The center of the atom contains a tight ball of neutrons and protons, which is held together by the strong nuclear force. Unstable nuclei may undergo alpha decay, in which they emit an energetic helium nucleus, or beta decay, in which they eject an electron (or positron). After one of these decays the resultant nucleus may be left in an excited state, and in this case it decays to its ground state by emitting high energy photons (gamma decay). The study of the strong and weak nuclear forces led physicists to collide nuclei and electrons at ever higher energies. This research became the science of particle physics, the most important of which is the standard model of particle physics which unifies the strong, weak, and electromagnetic forces. A light nucleus can contain hundreds of nucleons which means that with some approximation it can be treated as a classical system, rather than a quantum-mechanical one. In the resulting liquid-drop model, the nucleus has an energy which arises partly from surface tension and partly from electrical repulsion of the protons. The liquid-drop model is able to reproduce many features of nuclei, including the general trend of binding energy with respect to mass number, as well as the phenomenon of nuclear fission. Much of current research in nuclear physics relates to the study of nuclei under extreme conditions such as high spin and excitation energy. Nuclei may also have extreme shapes (similar to that of American footballs) or extreme neutron-to-proton ratios. Experimenters can create such nuclei using artificially induced fusion or nucleon transfer reactions, employing ion beams from an accelerator. Beams with even higher energies can be used to create nuclei at very high temperatures, and there are signs that these experiments have produced a phase transition from normal nuclear matter to a new state, the quark-gluon plasma, in which the quarks mingle with one another, rather than being segregated in triplets as they are in neutrons and protons. If a nucleus has too few or too many neutrons it may be unstable, and will decay after some period of time. For example, nitrogen-16 atoms (7 protons, 9 neutrons) beta decay to oxygen-16 atoms (8 protons, 8 neutrons) within a few seconds of being created. In this decay a neutron in the nitrogen nucleus is turned into a proton and an electron by the weak nuclear force. The element of the atom changes because while it previously had seven protons (which makes it nitrogen) it now has eight (which makes it oxygen). Many elements have multiple isotopes which are stable for weeks, years, or even billions of years. When two light nuclei come into very close contact with each other it is possible for the strong force to fuse the two together. It takes a great deal of energy to push the nuclei close enough together for the strong force to have an effect, so the process of nuclear fusion can only take place at very high temperatures or high densities. Once the nuclei are close enough together the strong force overcomes their electromagnetic repulsion and squishes them into a new nucleus. A very large amount of energy is released when light nuclei fuse together because the binding energy per nucleon increases with mass number up until nickel-62. Stars like our sun are powered by the fusion of four protons into a helium nucleus, two positrons, and two neutrinos. The uncontrolled fusion of hydrogen into helium is known as thermonuclear runaway. Research to find an economically viable method of using energy from a controlled fusion reaction is currently being undertaken by various research establishments (see JET and ITER). For nuclei heavier than nickel-62 the binding energy per nucleon decreases with the mass number. It is therefore possible for energy to be released if a heavy nucleus breaks apart into two lighter ones. This splitting of atoms is known as nuclear fission. The process of alpha decay may be thought of as a special type of spontaneous nuclear fission. This process produces a highly asymmetrical fission because the four particles which make up the alpha particle are especially tightly bound to each other, making production of this nucleus in fission particularly likely. For certain of the heaviest nuclei which produce neutrons on fission, and which also easily absorb neutrons to initiate fission, a self-igniting type of neutron-initiated fission can be obtained, in a so-called chain reaction. [Chain reactions were known in chemistry before physics, and in fact many familiar processes like fires and chemical explosions are chemical chain reactions]. The fission or "nuclear" chain-reaction, using fission-produced neutrons, is the source of energy for nuclear power plants and fission type nuclear bombs such as the two that the United States used against Hiroshima and Nagasaki at the end of World War II. Heavy nuclei such as uranium and thorium may undergo spontaneous fission, but they are much more likely to undergo decay by alpha decay. For a neutron-initiated chain-reaction to occur, there must be a critical mass of the element present in a certain space under certain conditions (these conditions slow and conserve neutrons for the reactions). There is one known example of a natural nuclear fission reactor, which was active in two regions of Oklo, Gabon, Africa, over 1.5 billion years ago. Measurements of natural neutrino emission have demonstrated that around half of the heat emanating from the earth's core results from radioactive decay. However, it is not known if any of this results from fission chain-reactions. As the Universe cooled after the big bang it eventually became possible for particles as we know them to exist. The most common particles created in the big bang which are still easily observable to us today were protons (hydrogen) and electrons (in equal numbers). Some heavier elements were created as the protons collided with each other, but most of the heavy elements we see today were created inside of stars during a series of fusion stages, such as the proton-proton chain, the CNO cycle and the triple-alpha process. Progressively heavier elements are made during the evolution of a star. Since the binding energy per nucleon peaks around iron, energy is only released in fusion processes occurring below this point. Since the creation of heavier nuclei by fusion costs energy, nature resorts to the process of neutron capture. Neutrons (due to their lack of charge) are readily absorbed by a nucleus. The heavy elements are created by either a slow neutron capture process (the so-called s process) or by the rapid, or r process. The s process occurs in thermally pulsing stars (called AGB, or asymptotic giant branch stars) and takes hundreds to thousands of years to reach the heaviest elements of lead and bismuth. The r process is thought to occur in supernova explosions because the conditions of high temperature, high neutron flux and ejected matter are present. These stellar conditions make the successive neutron captures very fast, involving very neutron-rich species which then beta-decay to heavier elements, especially at the so-called waiting points that correspond to more stable nuclides with closed neutron shells (magic numbers). The r process duration is typically in the range of a few seconds. Atomic nucleus Facts for Kids. Kiddle Encyclopedia.